The Sisters High School equestrian team took part in the first of three district meets last month. The meet was held at the Deschutes County Fairgrounds; athletes trailered in their mounts on Thursday afternoon and got ready for three full days of competition. The team is made up of 10 athletes, three returning from last year and seven new team members. There is a high level of talent and commitment that is necessary to compete in equestrian events at the high school level: Not only do athletes have to condition themselves, but they are responsible for the care and peak performance of their horses. Coaches Annie Winter and Julie Knirk were extremely happy with how the team performed, with many successes in a variety of events. They also commended the team spirit that each athlete showed and the supportive atmosphere that helped buoy each other up when things did not quite go as planned. The incoming winter storm meant that some of the gaming events had to be postponed until the next meet (March 15-17 at Brasada Equestrian Center). The Central District includes teams from Central Oregon plus The Dalles, Pendleton, Lakeview and Dufur; they had a long way to drive home in poor conditions. Hunt seat equitation: Shea Robertson. Working pairs: Chloe Winter/Sidney Sillers and Bailey Knirk/Shea Robertson. Team Versatility: Josie Berg/Bailey Knirk/Shea Robertson/Madi Larabee and Rheanna Salisbury/Jackson Robinson/Sidney Sillers and Hailee Kennedy. Working Rancher: Shea Robertson and Jackson Robinson. 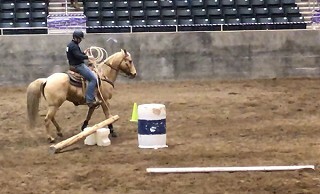 Reining: Shea Robertson and Sidney Sillers. Team Penning: Hailee/Josie/Shea and Savy Salisbury/Bailey/Sidney. Team Flags: Chloe/Sidney/Rheana/Josie and Hailee/Bailey/Madi/Shea. Barrels: Madi, Bailey, Josie, Hailee.